A few days ago I went to see Craig Thompson in discussion with Marcel Theroux at the St Alban’s Centre in London. He gave a talk about the research and creation process for his book Habibi. 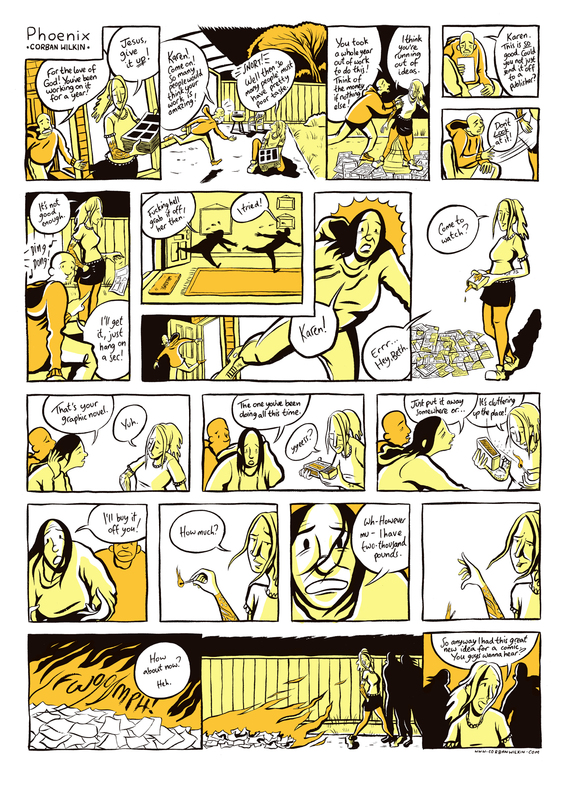 The inking style Thompson uses in Habibi is something I’ve been trying to use in my own drawing. He beautifully combines thick and ragged, dry lines with fine little areas of hatching. I’m particularly enamoured with the way he renders trees and rocky cliffs, seen here on the lower-right in a panel from Habibi. On the left is a recent illustration of my own on the subject of technological singularity (predicted to occur in 2045!) which features a cliff in an attempted Thompsonesque style, with the robot atop the peak being rendered more smoothly and carefully. This black and white version really shows the lines nicely, but there’s a full-colour version in my portfolio. Recently, whilst eating my breakfast, I’ve been copying images from the sizeable collection of art books we have in our house in order to try to learn something by drawing in new ways. Above are a couple of simple Van Gogh studies in fine liner. I’ve never been much involved with fine art (like, I think, most illustrators and cartoonists), but I’ve been growing to love some of the work by those ubiquitous modern masters Van Gogh and Picasso (for Pablo, mainly his early period of work). For composition and line quality, one can find ways of thinking and working that illustrators don’t often use and perhaps find some unique qualities to put in to illustrations. After all, most new developments in illustration spring from developments in the fine art world. Elements of expressionism and impressionism are now widely used in illustration and comics without a second thought, and cartoons themselves seem to me to have been influenced in their course during the 20th century by abstract art and cubism. More than anything, though, one can just learn from the beautiful drawing. Van Gogh’s hard but dynamic outlines are akin to the line an illustrator, working in ink and armed with a brush or nib, might use. I’ve attended various comics-based events over the past week inlcuding the private view of the Cartoon Museum’s follow up to the huge Steve Bell exhibition, an exhibition devoted to Doctor Who in Comics. Above is one of the pages of original art on display, of which there are many by a wide variety of artists. Dave Gibbons and David Lloyd both feature, as well as Alan Moore as a writer. As always, it’s incredible to see pages of original comics art. Very inspiring. Just last night I attended another meeting of cartoonists organised by The Comix Reader, which also proved to be a decent social gathering of the London comics core. Visiting from Australia was graphic novelist Bruce Mutard, who seems to be a hidden gem of antipodean comics, with a beautiful line drawing style which reminds one a bit of Adrian Tomine. Woodrow Phoenix (author of Rumble Strip) was there, along with Paul Gravett (head of the Comica festival), both whom I’d had the fortune to meet in 2009 at the London Print Studio in a discussion/presentation with several other comics people, as the culmination of a comics exhibition. I also shifted quite a lot of old copies of Paroxysm #1 and #2, and received a lot of self-published zines and comics in return. This is the first real convention I’ve been to, but it turned out to be a great experience and I’ll definitely be on the look-out for more in London as they come.